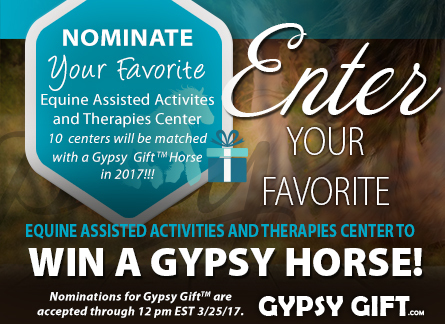 Gypsy Gift 2017 is now accepting nominations for your favorite PATH premiere accredited Equine Assisted Activities and Therapies center to Win 1 of 10 Gypsy Horses through LexLin Gypsy Ranch’s Gypsy Gift program! Nominations will be accepted through 12 pm EST March 25, 2017. 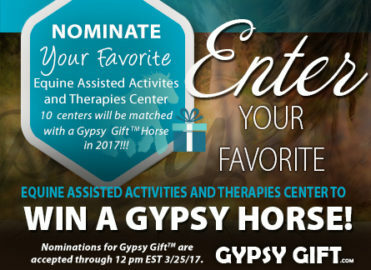 Visit GypsyGift.com for details and to submit a nomination today! *The 10 Gypsy Gift Horses will be announced on March 1, 2017! *Daily voting for your favorite center will begin at 12 pm EST on March 27, 2016 and run through 12 pm (noon) EST on June 15, 2017. The top 10 centers will be announced at 12 pm EST on June 16, 2016 and the centers will be presented with their Gypsy Gift Horses at our “Passing of the Lead” Gypsy Gift presentation in July or August (date will be announced soon) at LexLin Gypsy Ranch here in Rockwood, TN. Visit GypsyGift.com for more information.